Viridian has been a long-standing DrawBridge client for web design, development, and ongoing website maintenance. 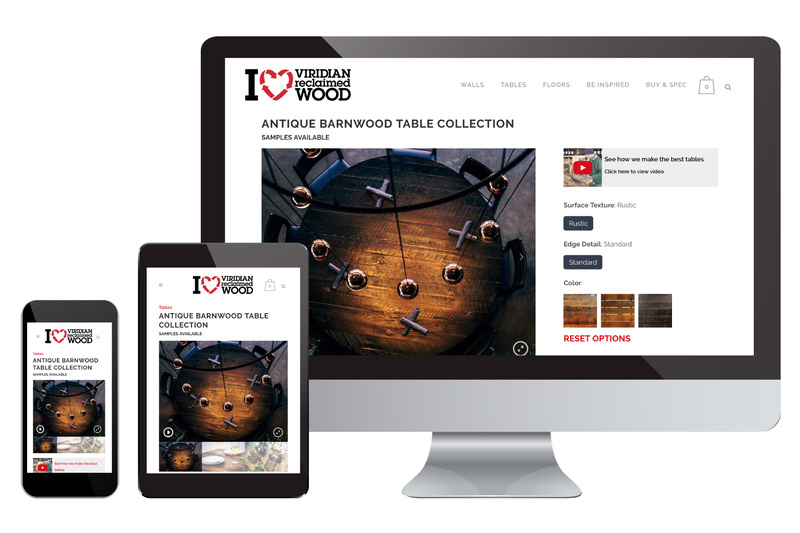 The partnership began when Viridian tasked DrawBridge with creating an e-commerce website for Viridian Wood that they could update as product availability changed. The website required specialized custom functionality including square footage calculators, integration with Salesforce CRM on the checkout and sample-request forms, custom features for product variations, product testimonials, and more. All of the technical functionality of the sites is cloaked in a beautiful user interface that emphasized large-format images and plenty of white-space to showcase the rich textures of the products. When running a highly-customized site, the risk is reduced loading speed, so we optimized the website for fast loading even with all of the functionality. We regularly work in conjunction with Viridian’s digital marketing agency to ensure the websites meet their SEO, SEM and marketing goals.